Japan Air Self-Defense Force maintainers pose for a photo during the arrival of the first Japanese F-35A at Luke Air Force Base Arizona in November 2016. Image Credit: U.S. Air Force photo by Tech. Sgt. Louis Vega Jr. 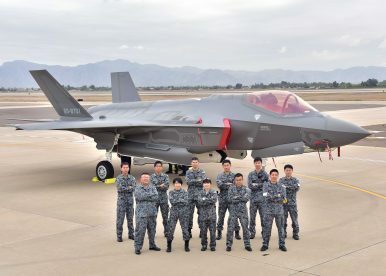 The Japan Air Self Defense Force (JASDF) has stoop up its first operational fifth-generation Lockheed Martin Lightning II F-35A fighter squadron on March 26. The new F-35A fighter squadron, the 302nd Squadron, is part of the JASDF’s 3rd Air Wing and is stationed at Misawa Air Base in the northern part of Honshu island. The squadron swapped its McDonnell Douglas-Mitsubishi F-4EJ-Kai Phantom IIs for the F-35A, the aircraft’s conventional takeoff and landing variant. The unit reportedly consists of 13 F-35As. In January 2018, the JSDF deployed its first F-35A at Misawa Air Base and periodically took delivery of additional F-35A for the past 15 months. The first four F-35As were all built in the United States, while the remaining F-35As of the squadron were assembled at the Mitsubishi Heavy Industries (MHI) F-35 Final Assembly and Check Out (FACO) facility in Nagoya. Local production is expected to continue at least until the end of fiscal year 2022. The JASDF is slated to take delivery of six F-35As in the upcoming Japanese fiscal year that runs from April 1, 2019, to March 31, 2020. The Japanese government selected the F-35A as Japan’s next-generation fighter aircraft in December 2011 and initially placed an order for 42 fifth-generation fighter jets. In December 2018, the cabinet of Japanese Prime Minister Shinzo Abe approved an increase of Japan’s existing order of 42 to 147 F-35 aircraft including an additional 63 F-35As and 42 F-35Bs, the U.S. Marine Corps’ short take-off and vertical landing (STOVL) variant of the aircraft. “The current NDPG and the fiscal 2019-2023 midterm defense buildup program outline an initial procurement of 27 F-35As and 18 F-35Bs over the next five years,” I wrote in December 2018. “Total acquisition costs for the additional 63 F-35As and 42 F-35Bs will likely exceed $10 billion.” Notably, the JS Izumo, the lead ship of the Izumo-class, is expected to be converted into an aircraft carrier capable of launching the F-35B. Both JASDF F-35 variants will be armed with long-range standoff missiles. Norwegian defense contractor Kongsberg Defense & Aerospace concluded an agreement last month with the Japanese government to provide “the initial deliveries” of next-generation, long-range, precision-guided Joint Strike Missiles (JSMs) for the JASDF’s burgeoning F-35A fleet.The JSM can be carried inside the F-35’s internal weapons bay.